Looking for deals in Leipzig? This hotel is located in the center of Leipzig, within a 3-minute walk of Leipzig Main Station. Adina Apartment Hotel Leipzig offers free WiFi, a fitness room, sauna and indoor pool. Great location, very safe, good walking distance to historic Leipzig. Motel One Leipzig-Augustusplatz is centrally located in Leipzig, at Augustusplatz Square. Leipzig Central Train Station is a 5-minute walk away. Free Wi-Fi access is available. Very comfortable. Great location. So much to see and do. This hotel is located in the heart of Leipzig, a 2-minute walk from Leipzig Main Station. Vienna House Easy Leipzig offers free high-speed WiFi, a mobile concierge and a gym overlooking the city. What a beautiful city Leipzig is! The hotel was an easy walk to the city center! They have a car parking garage where you can park your car and don't use it while you are there as you can walk or take public transportation easily. The rooms were clean and comfortable. Breakfast was amazing and there is a self service bar area in the evenings for a drink or coffee. The hotel staff spoke excellent English. The people in the town are so friendly and welcoming. The Christmas Market is amazing, so be sure to stop here if you are doing a Christmas Market tour! If you are traveling by train, this hotel is directly across a main city street. Set in a beautifully restored 19th-century building, Michaelis lies just south of Leipzig city center, a few minutes’ walk from the New Town Hall and the pedestrian areas. Great location for walking into town. Parking secure in gated area. Located in the very heart of Leipzig city center, InterCityHotel Leipzig offers comfortable rooms with free WiFi just 984 feet from Leipzig Train Station. Perfect location for visiting Christmas markets. Very clean and comfortable. Designer rooms, free WiFi and a free 24-hour wellness area with indoor pool are offered at this hotel, just a 10-minute walk from Leipzig Main Station and the historic Old Town. The location, the friendliness of staff and of course the spa. This centrally located, elegant hotel in Leipzig features elegant accommodations, free WiFi throughout the property, and a wonderful spa area with indoor pool. The hotel is located with easy walking access to the train station and the central area of Leipzig. Offering free WiFi and rooms and apartments, this family-run hotel is just 0.6 mi from Leipzig city center. As good as a Best Western in the US, but only 33 Euro. This hotel offers rental bikes, a spa area with sauna, and free WiFi in all areas. It is located in Leipzig’s quiet Leutzsch district, beside the large Auenwald forest and a few steps from a bus stop.... We stayed one night for rest on our trip down to Munich, the staff was friendly. 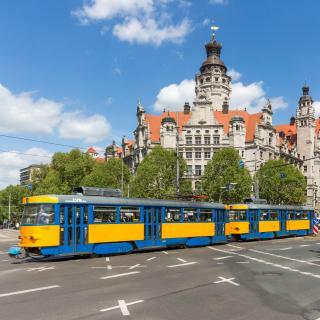 This apartment house is centrally located in Leipzig, 328 feet from Leipzig Main Train Station and 1969 feet from Zoo Leipzig and the Rosental park. Free WiFi is provided in all areas. Well, it's all new and quite nice and I like that they renovate the old house to period detail. This hotel lies in the green Alt-West district of Leipzig, just 1.9 mi west of the city center, The Lindenau Inn features a sauna area, a 24/7 fitness room and free WiFi access. The staff was awesome and the room was perfect. Built in 2016, Arthotel ANA Symphony is a modern design hotel offering free WiFi. This is a great boutique hotel. The staff is responsive and engaging. Located just 656 feet away from the main train station, Ibis Budget Leipzig City in Leipzig offers modern and simple rooms in Leizpig. Free WiFi access is available throughout the entire property. Very simple, but clean and comfortable. The breakfast was pretty good (and the coffee). Located directly in the downtown area of Leipzig, Ibis Leipzig City offers 125 air-conditioned rooms with free WiFi access. Really excellent location in city center. Very good breakfast. Quiet, comfortable room. This hotel is ideally located next to Leipzig Main Station and close to the city center. Centro Hotel Vier Jahreszeiten offers free WiFi and a 24-hour reception. Room was clean and hair-dryer, shampoo, towels were provided in the room. Located in Leipzig, Benkwitz Hotel provides free WiFi. Located around 3.2 miles from Panometer Leipzig, the hotel is also 3.5 miles away from Zoo Leipzig. New place so everything was completely new. You can feel the soul of the owner. This 4-star, Art Nouveau hotel features a steak restaurant. 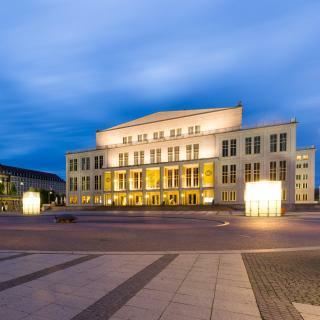 It offers a central location opposite Leipzig Main Station, a 2-minute walk from Leipzig Opera House. Very lovely hotel close to the centre of the fine city of Leipzig. This design hotel is located in the heart of Leipzig, just 492 feet from the Gewandhaus Concert Hall and Augustusplatz tram stop. It features a 24-hour gym and stylish rooms with free WiFi. Probably the best breakfast of a two week trip!! This 3-star hotel offers spacious rooms, regional Saxon cuisine and free parking. It lies in the Connewitz district to the south of Leipzig, and has good road and public transport links. Room generous, wardrobe had aroma of cedar!, breakfast great, dinner wonderful. Our type of hotel. This modern and cozy 3-star superior hotel is located in the north of Leipzig close to the airport and convention center in a peaceful yet easily accessible location. A very nice middle size hotel, well managed. 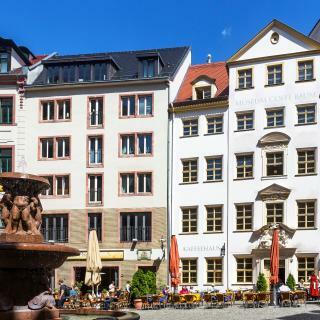 Which neighborhood is the best one to stay at in Leipzig? Leipzig City Center, Paunsdorf, and Reudnitz-Thonberg are popular with other travelers visiting Leipzig. What are the best hotels in Leipzig near Leipzig/Halle Airport? Travelers who stayed in Leipzig near Leipzig/Halle Airport (LEJ) have said good things about 7 Days Premium Hotel Leipzig Airport, Globana Airport Hotel, and Landhotel Glesien. Which hotels in Leipzig are good for couples? These hotels in Leipzig are highly rated by couples: Steigenberger Grandhotel Handelshof Leipzig, Book Hotel Leipzig, and Adina Apartment Hotel Leipzig. How much is a hotel in Leipzig for this weekend? The average price per night for a 3-star hotel in Leipzig this weekend is £115 or, for a 4-star hotel, £143. Looking for something even fancier? 5-star hotels in Leipzig for this weekend cost around £177 per night, on average (based on Booking.com prices). Which hotels in Leipzig have nice views? Voss Villa, Radisson Blu Hotel Leipzig, and Gästehaus Leipzig got great room view-related reviews from travelers in Leipzig. How much does it cost to stay in a hotel in Leipzig? On average, 3-star hotels in Leipzig cost £68 per night, and 4-star hotels in Leipzig are £87 per night. If you're looking for something really special, a 5-star hotel in Leipzig can be found for £149 per night, on average (based on Booking.com prices). Which hotels in Leipzig are good for families? Many families visiting Leipzig loved staying at Steigenberger Grandhotel Handelshof Leipzig, Hotel Fregehaus, and Book Hotel Leipzig. What are the best hotels in Leipzig near Arena Leipzig? Some of the best hotels in Leipzig near Arena Leipzig include Cora Apartments, Downtown Apartments Leipzig and Apartments an der Arena Leipzig. 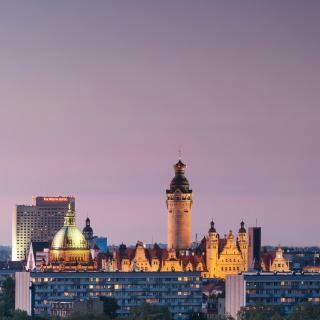 Which hotels are the best ones to stay at in Leipzig? Steigenberger Grandhotel Handelshof Leipzig, Book Hotel Leipzig, and Adina Apartment Hotel Leipzig are some of the popular hotels in Leipzig. Which hotels in Leipzig offer an especially good breakfast? For hotels in Leipzig that serve highly-rated breakfasts, try Hotel & Restaurant Michaelis, Vienna House Easy Leipzig, and Gästehaus Leipzig. How much is a hotel in Leipzig for tonight? On average, it costs £57 per night to book a 3-star hotel in Leipzig for tonight. You'll pay around £72 if you choose to stay in a 4-star hotel tonight, while a 5-star hotel in Leipzig will cost around £99, on average (based on Booking.com prices). 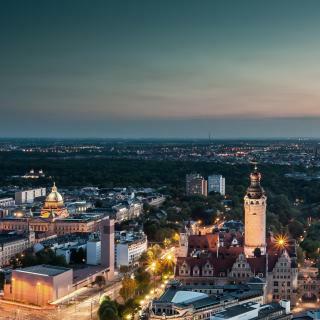 Famous for its history and exceptional architecture, Leipzig is an important city of commerce and culture. Called a “Little Paris” and home to many great composers and poets, this city has something for everyone’s taste. Its streets hide a lot of secrets, so keep your eyes open for unique passages, the most famous of which, Madlerpassage, is filled with upscale shops and bars. For a breath of culture, visit the houses of Mendelssohn, Schumman or most famous of them all, J.S. Bach, whose remains are buried in St. Thomas Church, where he worked until his death. 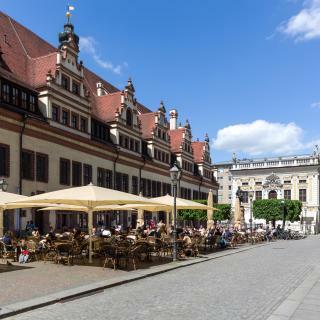 Leipzig’s architectural styles are best seen in person, so don’t miss the Plagwitz (an old industrial district), the Rundling inter-war housing estates built in concentric circles, or the stunning Renaissance Old Town Hall - a truly iconic landmark. For those tired of the city hustle, there are several lakes with beaches and water sports surrounding the city. A green belt of parks and woods also crosses Leipzig and gives some breathing space. 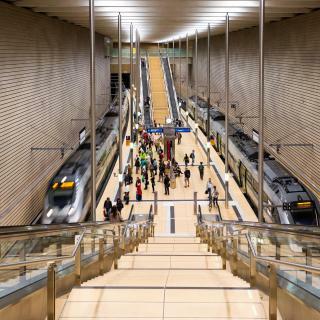 From Leipzig/Halle Airport, all of the city’s attractions are just a short ride away. 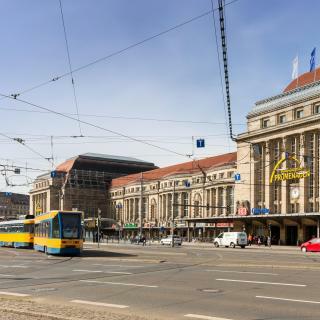 Whether you’re looking for a stunning hotel, a friendly guesthouse or a budget hostel, Booking.com has the perfect accommodations for your Leipzig trip. From Dresden we decided to make a short trip to Leipzig, so famous for its fair, young, fresh , fascinating STASI museum An der Runden Eck , which inexplicably is private and thus relatively amateurish. We loved Leipzig; however, make sure you speak some German. Very few English speakers, which was not a problem for us bc I speak German, but I did notice that many English speakers were having problems and I would step in to help. Lovely buildings, churches, and outdoor musicians everywhere. We took a tour bus, and it was so worth it. I highly recommend doing that. Fabulous restaurants, great food, coffee and cake shops. I found Stasi museum in der Runden Ecke extremely interesting, and I wish I had more time to spend there. The entrance is free. Amazing collection of items from those dark days of communist regime, fascinating information, photographs and stories of people. This should be part of curriculum in every school as an example of how political system can go wrong and as a warning to generations who are lucky not to have lived under communist system in Soviet block. I spent almost 100 Euros in Stasi museum shop on books and DVDs, the prices were good, and I would have easily spend more if the choice was bigger, but I got enough to keep busy reading and brushing up my very rusty German for a while. It was good to see a choice of very interesting books from Christoph Links Verlag. I enjoyed walking around the centre of Leipzig, but did not have enough time to see places. Great opportunity to buy excellent beers from this area of Germany. The beers in supermarket are 3-4 times cheaper than in the UK. Motorways near Leipzig are not too busy, so that one can easily reach speeds of 150 mph (240 km/h) or more. There are plenty to see here. There are plenty to see here. I took the hop on hop off but it almost did not have a designated hop on hop off area. rode the bus for one whole route and was dismayed that it seemed to steer away from the nice area like the new city hall. Didn’t even go to the old marktplatz. It passed by augustusplatz but did not stop. The only stop it made was in Völkerschlachtdenkmal. So I figured out that we just went around the touristic part of the city. Everything is walking distance from the train station. No need to take the hop on hop off. Leipzig is a hidden gem! Leipzig is a hidden gem! Love the quaint streets lined with great cafes and shopping! A pleasant mix of old and new. Zoo is wonderful and the Monument to the Battle of Nations is a must see! The hop on/off bus gives a good lay of the land! Bike to one of the nearby lakes! All around a great time! Very beautiful wooden staircase leading to the door. The appartment is 5 minutes walk from the north-west enterance to the city center, yet the street is quiet. Beautiful appartment, very cosey. Exactly like the pictures. All the anemities. Good WiFi. Spotless clean and lots of sunlight through the tall windows. Our host waited to welcome us and show us everything. A great place in Leipzig for a couple with (or without) a child. The apartment itself is very good located, easy to come, very clean and nice. Nothing wrong with that and after I have seen and experienced that, I could recommend this apartment hotel to everyone who's looking for the good apartment to stay in Leipzig. I will use it again. And thank you for saving my smartphone's charger which I forgot to my room (and I needed to come back to pick it up). Hotel was in the pedestrian part of Leipzig opposite St Nicholas church. We had a room overlooking the church which we think had a better outlook than rooms at the back. There is a car park next to the hotel which can be difficult to access due to it being next to the pedestrianised area. car parking was 10 euros per day. hotel is smart and rooms are clean and comfortable but quite small. An amazing hotel. Friendly staff, delicious breakfast with a huge choice for only €10. Rooms were lovely and spacious, bathroom clean and shower nice and powerful. The hotel is in a busy street but the windows kept out the noise and we didn’t hear any other guests either. Short tram ride into the centre of Leipzig which is a lovely city. Would recommend the hotel to anyone. Out of town location, but near tram stop. We wanted to stay in suburbs to experience East Germany. Travel pass for trains, buses and trams included in price. Great value. Hotel room was huge compared with Dresden City Centre. Only 5 stops on tram to Leipzig Hauptbanhof. Staff were friendly. Hotel was clean. Little bot "Old School", but in great condition. This hotel was amazing. It was pretty near the Leipzig Hbf. Very easy to find it and there were lots of restaurant in the Leipzig Hbf, which means you have so many choices about the food. Hotel staff was passionate and nice. The room was neat and tidy. It is absolutely worth visiting again. Very clean, stylish hotel. Comfortable bed, reasonably space in room, quality finishes ! We stayed in 3hotels in Leipzig and this was the best. Staff is very friendly and speaks English! Quiet during night, was a bit noisy during the day due to ongoing construction on sight. The hotel is well located, has style and good service. The breakfast is fantastic! They have lactose free and gluten free bread. In the evening the bar offers a good selection of cocktails. Great experience! The hotel is located with easy walking access to the train station and the central area of Leipzig. The breakfast buffet was well presented and the choices were varied and very good. Great location. very friendly reception.. very clean.. just next to hauptbahnhof.. The breakfast was not a good value for the cost, but it was convenient as it was on site. The location is excellent, the place is clean and is in a safe neighborhood. Parking is an issue, but we found a lot not too far away. They recommend street parking, but it was hard to tell where it was ok to park and where you need a pass or sticker. Better to pay for the lot and not worry. Thr rooms were large and the view from the fifth floor was pleasant.